Jo Agnes Wallace Lister, 90, of Macon, passed away Monday, February 4, 2019 at her home. Funeral services will be held at Hart’s Mortuary, Jones County Chapel, Friday, February 8, 2019 at 2:00 PM with the Reverend Randy Darnell and the Reverend Lee Griffin officiating. The family will greet friends at the Jones County Chapel, Thursday, February 7, 2019 from 5:30 PM until 7:30 PM. The family will also receive visitors at the residence of Mike and Debbie Wallace, 139 Pamela Drive, Macon. Interment will be private. In lieu of flowers, contributions may be made to the Alzheimer’s Association, 886 Mulberry Street, Macon, GA 31201 or Hospice Care Options, 486 New Street, Macon, GA 31201. Jo Agnes was the daughter of the late Ernest Augustus and Beulah Agnes Wood Fountain. After 30 years of employment, Jo Agnes retired from the accounting department at the Bibb Company. 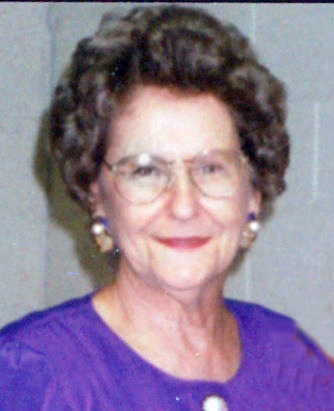 She was a former member of the Cross Keys Baptist Church for many years. She was also a member of Immanuel Baptist Church. She loved the Lord and made sure her children knew the Lord, as well. Jo Agnes immensely adored her children, grandchildren, and great grandchildren, as they were so very dear to her. She loved the feeling of the outdoors and working in the yard with her flowers. She was also an avid Elvis fan. Jo Agnes is survived by 3 daughters, Diane Wallace (Tony) Graham of Macon, Janna Wallace (Cleve) Rogers of Macon, Joy Wallace Smith of Macon; son, Mike (Debbie) Wallace; 2 step-children, Memory (Max) Brown of Athens, Bud (Janie) Lister of Macon; 9 grandchildren, Tripp Asbell, Brandy Asbell (Courtney) Hamilton, Amanda Stroud, Alisha Stroud (David) Mullis, Joni Smith, Justin (Kaylee) Smith, Lance Wallace, Blake (Brooke) Wallace, Tyler Hutcheson; 3 step-grandchildren; 7 great-grandchildren; 5 step-great grandchildren; and numerous nieces and nephews. Jo Agnes was preceded in death by her two loving husbands, William “Bill” Wallace and John “Gene” Lister, as well, as a brother, Kenneth Fountain and a sister, Grace Farrar. Please visit www.hartsmortuary.com to express condolences. Hart’s Mortuary, Jones County Chapel, 307 Pecan Lane, Gray, Georgia 31032, has charge of arrangements.